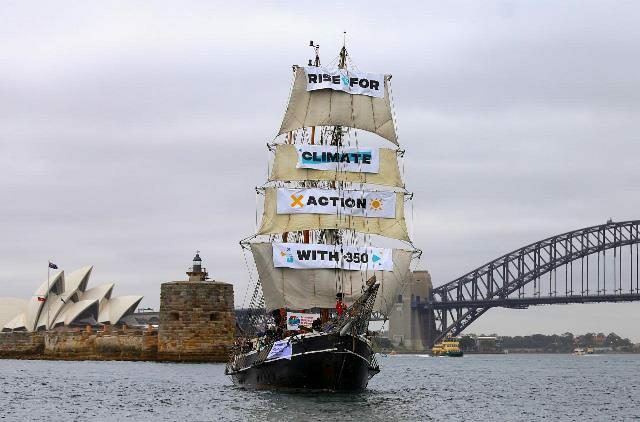 Tall ships carrying climate change banners sailed into Australia’s Sydney Harbour on Saturday launching a wave of protest across 95 countries organized by New York-based lobby group 350.org. Climate change is of great concern in the Pacific region with Pacific Island nations declaring on Friday that it is their “single greatest threat” and urging Washington to return to the Paris Agreement on climate. The protests have been timed to build climate change action ahead of the Global Climate Action Summit, 350.org said in a statement, where political, business and entertainment leaders including the Hungary President Janos Ader, Ikea Group chief executive Jesper Brodin and actor Harrison Ford are scheduled to speak. US-based lobby watchdog InfluenceWatch.org says on its website that 350.org’s closely related entity 350.org Action Fund almost exclusively supports Democratic politicians in US elections. Chief executive of 350.org Australia Blair Palese said her organization does not engage in party-political lobbying. “We really just call for action on climate across all parties and all countries … just calling for the public to ask all candidates what their positions are on climate and what kind of action they’re taking,” she told Reuters by telephone on Saturday.